Team Gundogs — Reiki practiced on dogs. Hunting dogs. Private training. Boarding. And guiding. Reiki is a non-harmful, non-painful hands-on healing method of creating balance within every living thing. Throughout the years, Reiki has evolved to be used all over the world by practitioners, medical professionals and even your next-door neighbor. Reiki has been studied through clinical research and has been found in blind studies to be effective for relieving stress, anxiety and pain. Pets respond to Reiki in the same manner as humans. This is the reason that I use Reiki in my training programs. Hourly sessions for 8 to 15-week-old pups are available. This will build a solid foundation for the up and coming Rookie gun dog. Our focus in Level One training will start with prey drive and chase and then move into gun conditioning. Then I will bring out the natural instinct in pointing or flushing of your All-star. We will then move into obedience training which also transfers to the field, and this is where we start introducing the E-collar conditioning and whistle commands if desired. This level of teaching is where the Rookies will start to understand the TEAM concept and that you are the Pack Leader and follow your directions. Commands that will be taught are: heel, here/come, and introduction to whoa. We will also teach quartering and retrieving with the commands. During this Rookie training, we will also be socializing your gun dog in and out of the field. Each session includes 15 minutes of Reiki. Dog owner participation is encouraged. 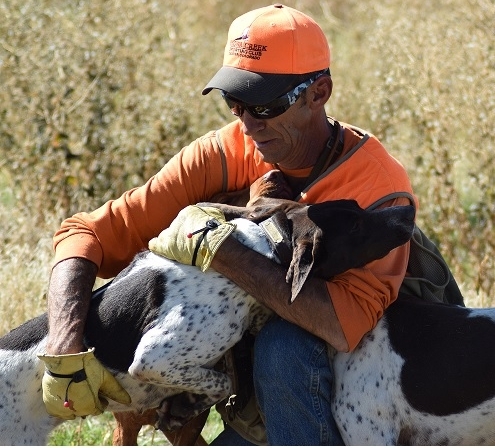 Team Gundogs Hall of Fame Gun Dog Training usually begins after the first season of hunting. This allows training to remain fun for your Rookie as they are guided into advanced commands and skills. These skills are a staunch on point, honoring/backing, stop/sit to flush, steady to wing or steady to wing and shot. Gun Dog owner participation is encouraged. Team Gundogs provides private training for any skills that need improvement from Rookie to Hall of Fame level gun dog training. 20% DISCOUNT ON ANY SERVICE FOR ALL FIRST RESPONDERS AND MILITARY PERSONNEL.